NBA Owners, Players Reach Tentative Deal The sides reached a tentative agreement early Saturday to end the 149-day lockout and hope to begin the delayed season with a marquee triple-header Dec. 25. Most of a season that seemed in jeopardy of being lost entirely will be salvaged if both sides approve the handshake deal. 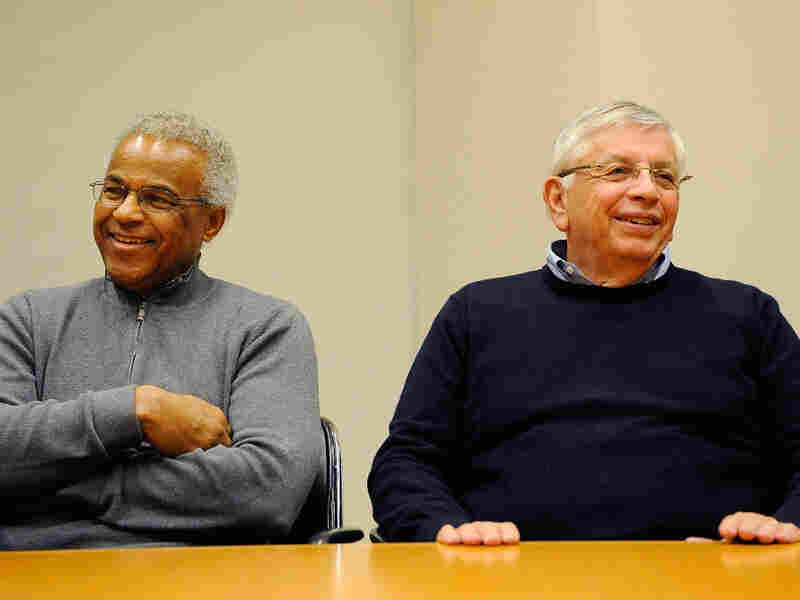 NBA Commissioner David Stern (right) and union executive director Billy Hunter speak to the media Saturday in New York City to announce a tentative labor agreement that would end the 149-day lockout. The sides reached a tentative agreement early Saturday to end the 149-day lockout and hope to begin the delayed season with a marquee triple-header Dec. 25. Most of a season that seemed in jeopardy of being lost entirely will be salvaged if both sides approve the handshake deal. "All I feel right now is 'finally,' " Miami Heat star Dwyane Wade told The Associated Press. Just 12 days after talks broke down and Stern declared the NBA could be headed to a "nuclear winter," he sat next to Hunter to announce the deal. The union needs a simple majority of its 430-plus members. That process is a bit more complicated after the players dissolved the union Nov. 14. Now, as part of the agreement, says NPR's Mike Pesca, the union must be recertified, and the players must drop their antitrust lawsuit before a new collective bargaining deal can be completed. "There will be no court case going forward," Pesca says. "That's settled as part of this negotiation." The reason for the settlement was we've got fans, we've got players who would like to play, and we've got others who are dependent on us. And it's always been our goal to reach a deal that was fair to both sides and get us playing as soon as possible, but that took a little time. Pesca says the division of revenue now is likely to be about 50-50. "And then beyond that, there are some luxury tax issues, there are some [of] what they call 'system issues,' " he says. "But by and large, and for the most part, the sides weren't really that far apart ... And with a few concessions here and there, and with a few of the most cantankerous negotiators excluded from the latest session, they were able to get it done." But it wasn't an easy agreement, said deputy commissioner Silver. "The owners came in having suffered substantial losses and feeling the system wasn't working fairly across all teams. I certainly know the players had strong views about expectations in terms of what they should be getting from the system. It required a lot of compromise from both parties' part, and I think that's what we saw today." "For us the litigation is something that just has to be dealt with," Stern said. "It was not the reason for the settlement. The reason for the settlement was we've got fans, we've got players who would like to play, and we've got others who are dependent on us. And it's always been our goal to reach a deal that was fair to both sides and get us playing as soon as possible, but that took a little time."